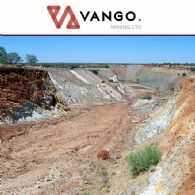 Vango Mining Limited (ASX:VAN) is an ASX-listed gold mining company presently focusing on the development of the K2 Underground Development Project, part of the broader 820,000oz Plutonic Dome Project in central Western Australia. 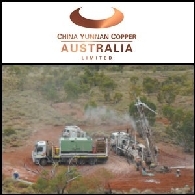 Gold exploration and development company Vango Mining Limited (ASX:VAN) is pleased to announce positive results from a recently completed upgraded Definitive Feasibility Study (DFS) on its K2 Deposit within the wider 100%-owned Plutonic Dome Gold Project, in the Mid West region of Western Australia. Asian Activities Report for June 2, 2011 includes: Ord River Resources Limited&apos;s (ASX:ORD) 49%-owned Sino Australian Resources Co., Ltd signed a Memorandum of Understanding with China Non-Ferrous Metal Industry&apos;s Foreign Engineering & Construction Co. Ltd (SHE:000758) for a proposed Engineering, Procurement and Construction contract; Minemakers Limited (ASX:MAK) signed a Memorandum of Understanding with NMDC Limited (BOM:NMDC) for the development of the Wonarah Phosphate deposit in the Northern Territory; Unity Mining Limited (ASX:UML) has commenced the development of the Newton Zone at the Henty Gold Mine; Discovery Metals Limited (ASX:DML) reported high grade copper silver intersections from the Plutus deposit within its 100% owned Boseto copper project. Australian Market Report of January 7, 2011 includes: China Yunnan Copper Australia (ASX:CYU) announced significant heavy rare earth element discovery in Queensland; Carnarvon Petroleum Limited (ASX:CVN) updated on the oil drilling operations onshore Thailand; Brighton Mining Group Limited (ASX:BTN) is to commence drilling at the Antrong Project in Cambodia; Ord River Resources Limited (ASX:ORD) has completed drilling work on the Yuqida tenement at the Bauxite Project in Laos. 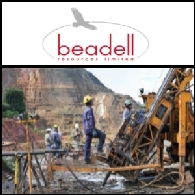 Australian Market Report of January 5, 2011 includes: Beadell Resources (ASX:BDR) announce significant high grade gold discovery in Western Australia; Jacka Resources Limited (ASX:JKA) commenced first oil drilling in Tunisia; Aurora Minerals Limited (ASX:ARM) has received Capricorn Southeast Manganese Project drilling results; Ord River Resources Limited (ASX:ORD) will complete Yuqida&apos;s drilling work for Laos Bauxite Feasibility Study in January. Australian Market Report of November 30, 2010 includes: Ord River Resources Limited (ASX:ORD) has signed a binding Heads of Agreement with Guangdong Rising Asset Management Co., Ltd to establish a Joint Venture Company in Australia; China Yunnan Copper Australia Limited (ASX:CYU) has commenced a 2,000 metre RC drill programme at the Humitos Copper Porphyry project in Chile; Segue Resources Limited (ASX:SEG) signs MOI with a Korean consortium to review its Pardoo magnetite iron project; Silver Mines Limited (ASX:SVL) reports more high grade silver results in NSW. 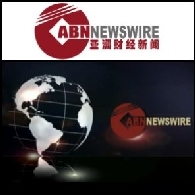 ABN Newswire stocks to watch today include: Environmental Clean Technologies Limited (ASX:ESI), Ord River Resources Limited (ASX:ORD) (PINK:ORDRF), FerrAus Limited (ASX:FRS) (PINK:FRRAF) and D&apos;Aguilar Gold Limited (ASX:DGR). Ord River Resources Limited (ASX:ORD) (PINK:ORDRF) is pleased to announce that ORD and its Joint Venture Partner China Nonferrous Metal Industry&apos;s Foreign Engineering and Construction Co., Ltd ("NFC") have successfully completed the acquisition of a 35% interest in the holding company Hong Kong Yuqida S.A. Limited ("Yuqida HK"). 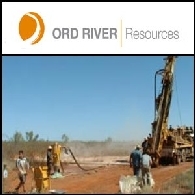 Ord River Resources Limited (ASX:ORD)(PINK:ORDRF) advises that it has signed a Subscription Agreement named "Equity Line Facility" ("the Facility") with China Non-Ferrous Metals International Mining Co. Ltd ("CNMIM") for A$10 million over the next three years. Ord River Resources Limited (ASX: ORD) - Scoping Study Commences for Alumina Refinery in Laos - Mr Martyn Jones, Executive Director; Ord River Resources Limited (ASX: ORD) present the following audio webcast regarding "ORD - Scoping Study Commences for Alumina Refinery in Laos - Mr Martyn Jones, Executive Director". You may also download this audio webcast to your computer or portable audio player. 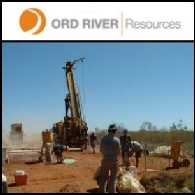 Ord River Resources (ASX:ORD) announce that the recent reconnaissance RC drilling at Copper Flats has been designed to delineate the structure and potential zones of mineralisation associated with a number of highly Cu (copper) mineralised sand volcanoes. The lateral extent of the mineralisation is controlled by the permeability of the basaltic flow breccias immediately adjacent to the sand volcanoes and by joint sets underlying the volcanoes.